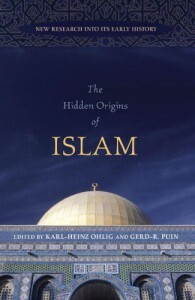 Like What the Koran Really Says: Language, Text and Commentary, The Hidden Origins of Islam is a collection of essays written by scholars who have subjected the source texts of Islam to the same critical examination that Christian and Jewish texts have endured. As well, some of these authors have marshaled recent (and, in some cases, not so recent) archaeological and numismatic evidence to reconstruct the Middle East of the 7th and 8th centuries (Christian era) with surprising results. The general reader be warned: Some of these papers are written for the specialist and are largely meaningless to a dilettante like myself. Other essays are accessible, however, and offer a fascinating glimpse at a radical reinterpretation of the accepted history of Islam’s first three centuries. Islam, as we understand the word – i.e., a distinctive religion based upon a revelation vouchsafed to a Meccan merchant named Muhammad in the first decades of the 7th century AD that called for a return to the pure worship of a transcendent, unitary God – is the product of a radical revisionist program instigated by `Abd al-Malik, the Umayyad ruler from AD 685-705. * This rewriting of history rivals the one undertaken by Josiah (and subsequent post-Exile priests) in regard to Israelite history (if true), and its lay in the political and religious history of the region. In the religious sphere, ever since Constantine had made Christianity the state religion, the Roman Empire had been troubled by controversies over the nature and role of Jesus Christ. Was he fully human? Was he fully divine? Both? Was he a man inspired by the Holy Spirit (& thus “son of God” only in a figurative sense)? Was he God incarnate? What is the meaning of the crucifixion and resurrection? And other questions, which stoked a vibrant cauldron of intellectual ferment. It also created a volatile political situation that weakened Roman control over its Middle Eastern provinces and Egypt in the 6th century. The Sassanians, successors to the Parthians and masters of eastern Iraq and Iran, took advantage of Constantinople’s troubles to evict the Byzantines and rule the region for the next 30 years or so. In 622, in a culmination of a remarkable Roman recovery, Heraclius (610-641) inflicted a catastrophic defeat on the Persians, who were forced to retreat. The empire, however, was unable to restore direct control over its former provinces, with the exception of token garrisons in the more important religious and population centers like Jerusalem and Alexandria. Heraclius was forced to rely on Christianized Arabs, who had been filtering up from Arabia proper over the previous centuries, to maintain order (dynasties like the Lakhmids and Ghassanids). Unfortunately, from the Byzantine POV, many of these Arabs were heretics – Monophysites or worse. These religious divides, coupled with a growing sense of a distinctively Arab political identity, had grown so wide by `Abd al-Malik’s day that he could break entirely with Constantinople and establish an Arabic empire. The succeeding Abbasid rulers (from whose scholars we get our first written sources for Islamic history and religion) continued the historical rewrite that enshrined Mecca as the holy city of the new religion and created (out of whole cloth) the figure of Muhammad (until then, as these papers argue, the words “muhammad” (“praiseworthy”) and “rasul” (“prophet”) had referred to Jesus). I do not have the background to competently assess how solid these researchers’ footing is. I think they do make a good case that the received history needs significant reinterpretation – it did not happen the way Muslims and non-Muslims have believed (at least since the 9th century AD). Whether or not it happened along the lines presented in the three essays I summarized above is the open question. Not every author in The Hidden Origins of Islam would whole-heartedly agree with these papers (cf., “Pre-Islamic Arabic – Koranic Arabic – Classical Arabic: A Continuum?”, Pierre Larcher). But the point is that Islamic studies deserve the same level of scholarly investigation that Christian and Jewish studies have received, and that when such tools are used, a clearer understanding of the social, political and intellectual histories of the era becomes possible. As these are essays, it should not come as a surprise that full arguments cannot be made but all of these essays have very complete notes, and some have bibliographies nearly as long as the paper they accompany for anyone interested in pursuing further research. I found this book fascinating not only for the particular history it recounts but also for its illustration of how fragile historical memory is, and how easy it is to erase and to change. Recommended cautiously to amateur historians. * For simplicity, any dates referenced in this review are AD.